Switching to a salt water pool is more natural and cost effective over time than maintaining a traditional chlorinated pool. There are pros and cons to all decisions, but after you have decided to convert to a salt water pool, you can enjoy all the benefits, including less pool service Cape Coral. Believe it or not, switching to a salt water pool is easy when you know the process. One of the obvious benefits of a salt water pool is that you will no longer need to buy chlorine tablets, shock, or liquid tablets to manually add chlorine. Another benefit is that chloramines will be eliminated and the life of your pool will be extended if it is cared for properly. Chloramines are what create the chlorine smell and might make your eyes red or itchy. This does not mean that chlorine is completely eliminated from your pool. Actually, the salt water generator or salt water system is creating chlorine and adding it to the pool to keep it sanitized. Altogether, salt is more natural than the harsh chlorine chemicals normally added to a chlorine pool. You will have to consider the size of your pool and your budget when deciding on a salt system. 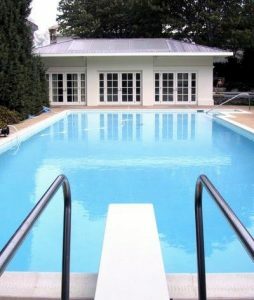 You can find a variety of systems that are for 10,000 gallon-100,000 gallon pools. Salt systems have a wide range of price and can cost anywhere from $400-$2,000, depending on the included features. Also, the longer you live in your home with a pool, the more you benefit from the salt system because you aren’t shelling out money each pool season to add chemicals. Some people decide to install their own salt system while others hire a professional. If you decide to install your own system, be prepared to spend anywhere from three to six hours getting the job done. You will need to have some basic knowledge of plumbing and electrical work. On the other hand, a company will charge you anywhere from $300-$500 to install the new system. Be aware that the salt cell will need to be replaced every three to seven years, which can cost from $200-$700. After the system has been installed, you will need to add the salt. The size of your pool will determine how much salt will initially be added, but it should be within a range of 3,000-3,500 PPM. After your salt system has been set accurately, your pool shouldn’t be too hard to maintain. It is important to keep your pool well-maintained with balanced pH levels so you can enjoy your backyard oasis. Maintaining a saltwater pool is as easy as adding additional salt to maintain appropriate levels within the pool. Grand Slam Pools will provide reliable service for your pool so you can enjoy all the benefits of a salt water pool. Their honesty and integrity will leave you pleased that you chose their company to maintain your pool. Relaxing on a beach chair next to your salt pool will make you feel as if you are spending time in your own private resort. Take a dip in your salt pool and you won’t have to worry about red eyes, itchy skin, or the negative effects of chlorine tablets. Enjoy the benefits of your new saltwater pool.